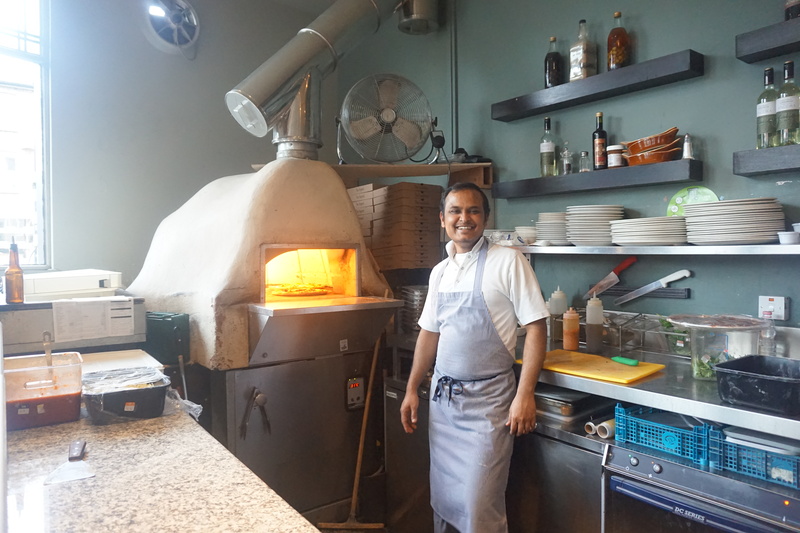 Our quest to discover London’s best gluten-free pizzas continued over the weekend with a visit to the Lauriston, having last year eaten at its sister pub the Regent. The two establishments are part of a trio – completed by the Hanbury Arms – of trendy pubs that offer stone baked gluten free pizzas, cooked in their onsite wood ovens. 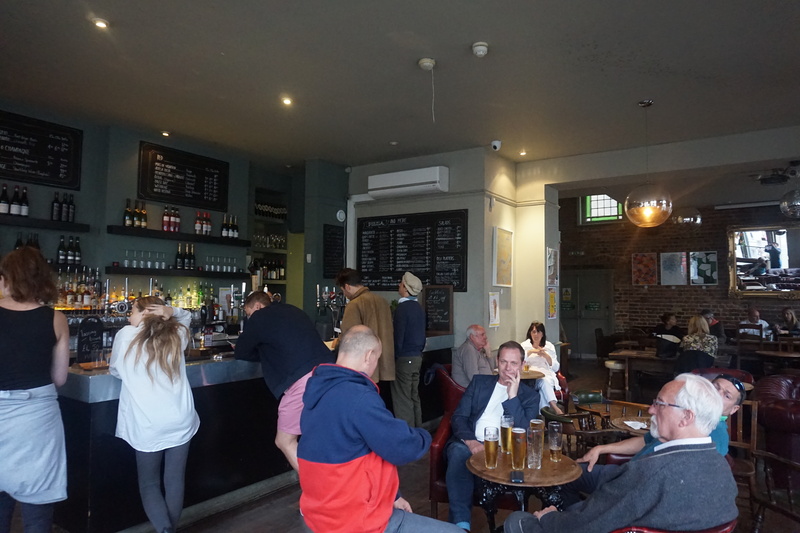 While the Regent and the Hanbury Arms are based in upmarket Islington, the Lauriston sits on a corner of Victoria Park Village – East London’s self-proclaimed “Leafy Little Secret”. The appearance of the pub is consistent with the classic look of many of the local delis and restaurants in the area, and it attracts a young-ish crowd of locals and visitors with regular pub quizzes and DJ nights, and a wide selection of craft beer. We dropped by on a Sunday evening around 8pm, and inside it was as lively as ever. The jukebox (another common feature of the group of pubs) played Daft Punk and the orders were coming in thick and fast as the two chefs worked their magic with the wood oven. We made our pick off the large menu on the side; after a lovely Italian antipasti starter, we ordered our pizzas. I went for the Baby Octopus (garlic, chilli, mussels, squid, tiger prawns & lemon), while my partner went for Jalapeno (fresh chilli, spicy salami, mixed peppers & homemade hot sauce). The pizzas would be washed down with a couple of bottles of Celia gluten-free lager. The toppings on both pizzas were generously served and high in quality. 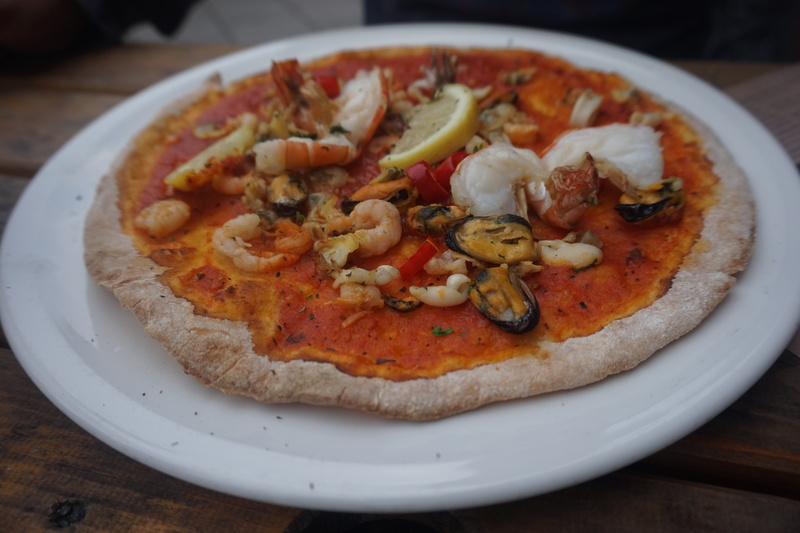 I was particularly taken by the tiger prawns, which were huge, full of flavour and cooked to perfection in their shells, while the hot sauce on my partner’s pizza gave the excellent salami the perfect (but not overly hot) kick. Gluten-Free Baby Octopus Pizza – Delicious! The real test, however, for a gluten-free pizza lies in its base, and here the Lauriston passed with flying colours. Resident chef Pawel, rather than taking the safe option of bringing in ready-made bases, produces his own fresh dough daily at the Hanbury Arms using Doves Farm flour. The 300C wood-fired oven (cooking the pizzas in under 5 minutes) made for light, fluffy bases that were devoid of any of the overly crisp/biscuit texture often associated with gluten-free pizzas. In addition, the Celia beer lacked the bitter aftertaste of many of its peers. Our taste buds had been transported from East London to Naples in a matter of minutes. In total we spent just over £30, with a £1 supplement added for gluten-free pizzas due to the additional cost of producing them. 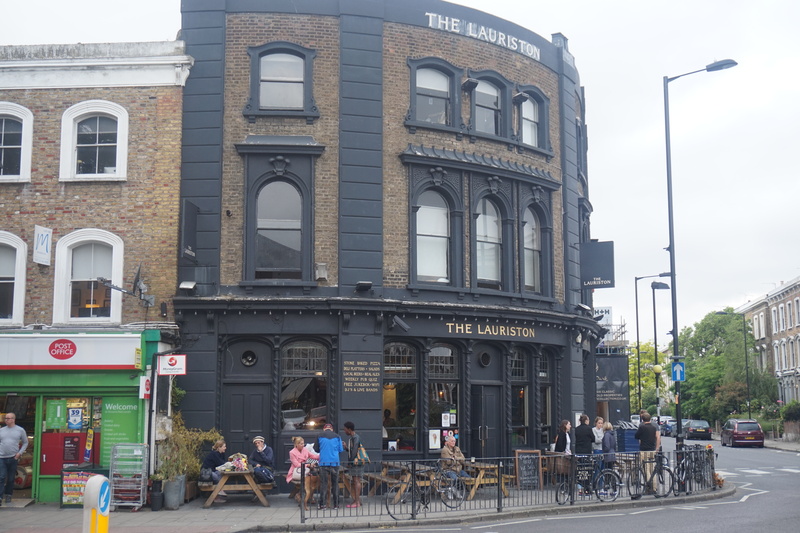 I’d recommend the Lauriston and its sister pubs to anyone, regardless of his or her dietary requirements, for its lively atmosphere and competitive prices. However, an even bigger incentive is given to those on a gluten-free diet in the form of their excellent pizzas.